Tuesday, May 1, 2018 from 3:30 p.m. – 6:30 p.m. Artificial intelligence (A.I.) is the science of building and programming a machine that’s able to imitate human cognition. Canada is home to some of the brightest minds in the field of artificial intelligence; it has been at the academic forefront of this field for over 30 years. Artificial intelligence presents boundless opportunities to transform human health. Already, it’s aiding in the discovery of new drugs and helping to create better, faster medical diagnostics. It’s not difficult to imagine a time in the near future when A.I. is able to reliably predict and intercept disease before symptoms arise. Theoretically, A.I. can take a person’s genome and recommend treatment options, while limiting or even eliminating side effects. A.I. can streamline drug development to be sure investigators study avenues which show the most promise and help identify previously undiscovered pathways that could lead to new treatments and therapies. The emergence and increasing use of artificial intelligence and robotics will have a significant impact on healthcare systems around the world. Dr. Masoom Haider is a Clinician Scientist and Professor of Radiology in the Department of Medical Imaging at the University of Toronto, Mount Sinai Hospital and Princess Margaret Cancer Center. He is using artificial intelligence to analyze MRI and CT scans to more precisely diagnose and determine best treatment in cancer patients. His lab has helped pioneer MRI techniques to diagnose prostate cancer which have helped avoid unnecessary treatment and painful biopsy in men. Dr. Doug Manuel creates predictive algorithms and planning tools using large linked administrative and clinical health data. He is a physician with specialization in Public Health and Preventive Medicine. His team’s predictive algorithms have been used worldwide by over 1 million people in the community and clinical setting, including at projectbiglife.ca. For over 25 years, he has been a primary care doctor in rural, remote and underserved Canadian communities. Dr. Parvin Mousavi is a Professor of Computer Science at Queen’s University, and a member of the Royal Society of Canada, College of New Scholars, Artists and Scientists. Her research interests are in machine learning for medical image processing and precision medicine, with applications in oncology, computer-assisted surgery, and neurology. Her new machine learning paradigm, “Temporal Enhanced Ultrasound”, is used for augmenting the detection of prostate cancer. With support from Canadian funding agencies, and with scientific and clinical collaborators, this technology is being tested in patients across North America. Dr. Guillaume Paré is a leading international clinician scientist in the area of genetic and molecular epidemiology of cardiovascular disease. His research focuses on discovering the genetic underpinnings of cardiometabolic diseases, such that individuals at risk of disease may be identified before symptoms are apparent, so early and effective preventative measures can be applied. Dr. Paré’s research implements multiple innovative genomic, proteomic, and bioinformatics approaches to identify high-risk patients, modifiable risk factors, and preventive therapies. Dr. David Harris Smith is an Associate Professor in the Department of Communication Studies and Multimedia at McMaster University and Director of Research for the macGRID Simulation Research Network. His current research involves the design and evaluation of social robotics and artificial intelligence applications for healthcare communication. Dr. Alain Dagher is a neurologist at the Montreal Neurological Institute and McGill University. He was trained at the University of Toronto, McGill, Cornell University, and Hammersmith Hospital, London. Dr. Dagher’s research uses anatomical and functional magnetic resonance imaging, positron emission tomography and transcranial magnetic stimulation to understand the human brain in health and disease. His research focuses on Parkinson’s disease, stress, addiction, gambling and obesity, as well as problem-solving, learning and experience of musical pleasure. Dr. Anna Goldenberg is a Scientist at the SickKids Research Institute, an Assistant Professor in the Department of Computer Science at the University of Toronto and faculty member at Vector. She is an expert in developing machine learning approaches for biological data, network methods and most recently, data integration of omics and clinical data. The current focus of her research is on developing methods that capture heterogeneity and identify disease mechanisms in complex human diseases. Dr. François Laviolette is the founding director of Laval University’s Big Data Research Centre. He is a leader in PAC-Bayesian theory, a branch of learning theory that provides a better understanding of existing learning algorithms and facilitates the process of designing new ones. Professor Laviolette has also acquired solid expertise in bioinformatics. Within this field, he has worked on interpretable artificial intelligence that has led to the discovery of valuable knowledge for new medical applications. Dr. Mingkai Peng is a Research Assistant Professor in the Department of Community Health Sciences at the University of Calgary and a Data Scientist at the Libin Cardiovascular Institute of Alberta. He leads the health informatics section at the Method Hub in O’Brien Institute of Public Health. His research interests focus on the methodology development to enable the optimal use of administrative health data and electronic medical records, such as data quality assessment and improvement, and phenotyping algorithms development. Dr. Hude Quan is the Director of the World Health Organization Collaborating Centre in Classification, Terminology and Standards at the University of Calgary. Thomson Reuters listed him as one of the world’s highly cited researchers. Dr. Quan is developing and testing digital health informatics methodology and also applying the methodologies in precision health, health services and chronic disease surveillance and outcomes research. Dr. Kimberley Adams is an Associate Professor with the Faculty of Rehabilitation Medicine, University of Alberta. She worked for 20 years in various countries in the area of assistive technology for people with disabilities before returning to academia. Her research interests include using assistive robots for children with physical impairments to engage in play and learning activities. In addition, she collaborates in the development of robots and alternative input methods to make them easier to use. Dr. Randy McIntosh is a senior scientist at Baycrest’s Rotman Research Institute, and a Professor of Psychology at the University of Toronto. He has a background in cognitive psychology and computational neuroscience. Dr. McIntosh’s research uses brain imaging data sets to construct computational models of brain health disease, using TheVirtualBrain (thevirtualbrain.org). The computer models are optimized with machine learning to fit an individual’s brain, driving the frontiers of personalized medicine. Dr. Frank Rudzicz is a scientist at the University Health Network, an assistant professor of Computer Science at the University of Toronto, co-founder and President of WinterLight Labs Inc., and faculty member at the Vector Institute. His research is in machine learning, natural language processing, health informatics, and speech-language pathology. Dr. Rudzicz uses natural language processing to augment speech recognition, to design robots that engage in conversation, and to assess cognitive disorders, such as Alzheimer’s disease, by analyzing short samples of speech. He is currently commercializing several of these contributions. Dr. Sean Hill is the Director of the Krembil Centre for Neuroinformatics, Senior Scientist at the Centre for Addiction and Mental Health, and Professor at the University of Toronto. Dr. Hill is a computational neuroscientist with experience in building large-scale computational models of brain circuitry. The Centre will collaborate with clinicians and researchers, employing neuroinformatics, artificial intelligence, and multiscale modeling, to develop data-driven definitions of brain disorders, predict patient trajectories, and transform mental health care. Dr. Natalia Jaworska is Director of the Clinical Electrophysiology Laboratory at the Institute of Mental Health Research and Assistant Professor at the University of Ottawa. Her research centres on understanding the brain in mental illness using various imaging techniques, including EEG (brain wave activity) and magnetic resonance imaging (MRI). Currently, in partnership with a company (MYndAnalytics®), her lab hopes to minimize guess work in treating depression using patients’ EEG data and machine-learning to provide clinicians with antidepressant treatment recommendations. 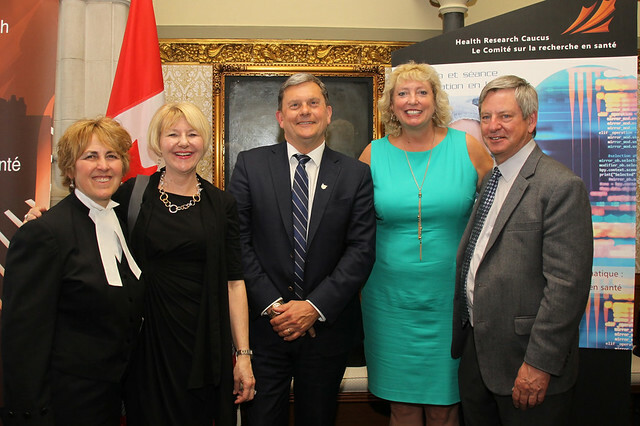 Research Canada is committed to profiling and supporting the work of researchers from our Membership and across Canada. Click here to see researcher profiles of other leading experts on artificial intelligence and machine learning research in Canada. AstraZeneca is a global, innovation-driven biopharmaceutical business with a primary focus on the discovery, development and commercialization of primary and specialty care medicines that transform lives. Our primary focus is on three important areas of healthcare: Cardiovascular and Metabolic disease; Oncology; and Respiratory, Inflammation and Autoimmunity. AstraZeneca Canada headquarters are located in Mississauga, Ontario. Durham College is a premier post-secondary destination, providing a dynamic, supportive learning environment for students. Applied research plays a substantial role in enriching the academic experience while allowing industry partners access to expert faculty who help to find real-world solutions for business and the community. Established in 1818, Dalhousie University is Atlantic Canada’s leading research-intensive university. Located in Halifax and Truro, Nova Scotia, our students and faculty engage in learning and discovery across 13 faculties, conducting more than $135 million in research annually with hospitals, industry, governments, non-profit agencies and universities around the globe.